In The Journal of the History of Biology, biologist Arlin Stoltzfus and I (co-authors) published an article called “Mendelian-Mutationism: The Forgotten Synthesis.” (It is open access so feel free to read it yourself!) 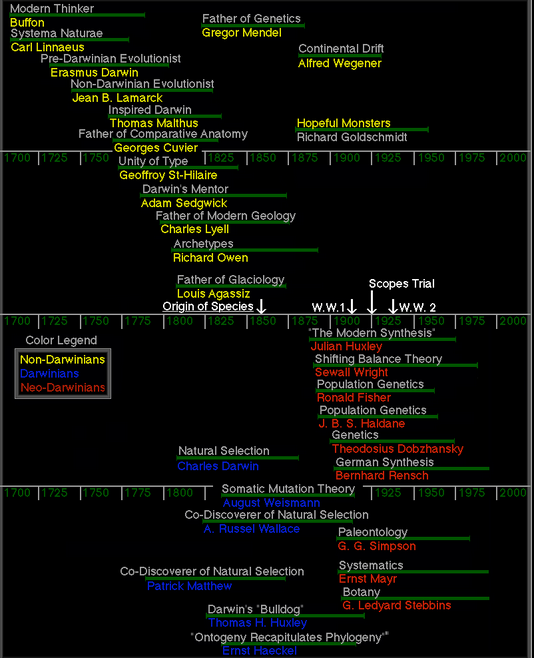 The goal of our paper is to place the mutationists/Mendelians (like Bateson and Morgan) firmly where they belong within the history of evolutionary thought: as main characters, and more especially, as protagonists, rather than antagonists or as not important at all, as seen in this UC Berkeley timeline. Timeline from UC Berkeley’s evolution website. Notice the only figure of early genetics shown is Mendel. Historian Jean Gayon has argued that Darwin’s original theory was stuck in the 19th century because his concept of the mechanism of “natural selection” was incompatible with genetics. He credits early geneticists with re-working the concept of selection for a Mendelian world, resulting in a different theory than Darwin imagined. We elaborate upon his thesis to argue that the genetical view of evolution, called “neo-Darwinism” and credited to Fisher, et al., could be just as rightfully called neo-Mendelism and credited to Bateson, Punnett, Morgan, and Johannsen. It will be of great interest to study the statistics of such a population in nature. 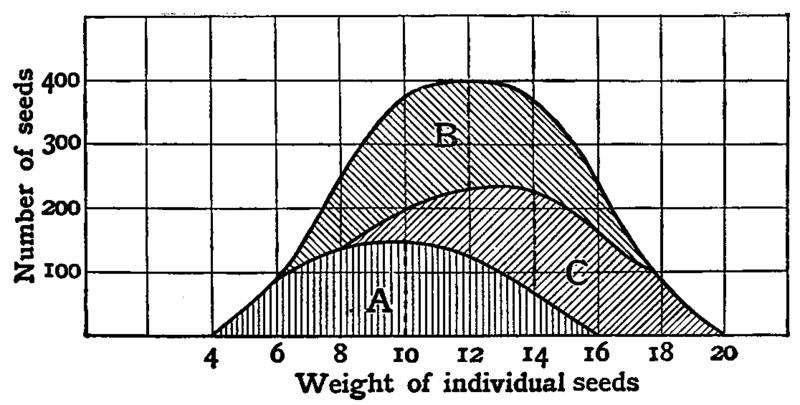 If the degree of dominance can be experimentally determined, or the heterozygote recognised, and we can suppose that all forms mate together with equal freedom and fertility, and that there is no natural selection in respect of the allelomorphs, it should be possible to predict the proportions of the several components of the population with some accuracy. Conversely, departures from the calculated result would then throw no little light on the influence of disturbing factors, selection, and the like. In the case of a population presenting continuous variation in regard to say, stature, … There are doubtless more than two pure gametic forms of this character, but there may quite conceivably be six or eight. When it is remembered that each heterozygous combination of any two may have its own appropriate stature, and that such a character is distinctly dependent on external conditions, the mere fact that the observed curves of stature give ‘chance distributions’ is not surprising and may still be compatible with purity of gametes in respect of certain pure types. i.e., the various combinations of homozygosity and heterozygosity at multiple loci affecting height, interacting with environmental effects like nutrition, can produce a continuous distribution of variation. This argument was empirically verified by the famous experiments of Wilhelm Johannsen the following year (discussed in the next post) and a few years afterward by Herman Nilsson-Ehle and Edward Murray East. 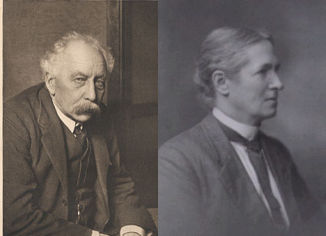 Thus, the Mendelians recognized how multiple genes could produce continuous distributions long before R. A. Fisher’s 1918 publication. What bothered them was not the idea that natural traits show apparently smooth variation that appears to blend, but that hereditary variation is actually smooth and actually blends. Figure 1. From Punnett, 1911. Both the Mendelian and the Darwinian view allow the complete transition from an ancestor population with one state, to a descendant population with another state. The difference emerges when one imagines the half-way point: in a Mendelian world, 50% of the population has the new state, and there is no intermediate in which 100% of the population has changed halfway. By contrast, in the Darwinian world, blending makes the converse true: at the halfway point, 100% of the population has changed halfway, but there is no point at which 50% has changed all the way. If we allow a bit of random noise, these two views might look the same when the change involves a few extra hairs on a fly’s abdomen, but they cannot look the same if the change involves an extra pair of wings. In the Darwinian view, these two states must be separated by thousands of phenotypic intermediates. The early geneticists usually aren’t given credit for this. Instead, it is credited to Darwin, as though the meaning of “natural selection” was always clear and always Mendelian. The UC Berkeley evolution website provides these pictures as an illustration of “Darwin’s grand idea of evolution by natural selection.” However, this is not Darwin’s natural selection; it’s a Mendelian-mutationist one! (The Wikipedia article on natural selection makes a similar mistake.) For Darwin, the population would have began as green and gradually shifted to brown – at the half-way mark, the population would have been half way between that dark green and light brown. Source: University of California Museum of Paleontology’s Understanding Evolution (http://evolution.berkeley.edu). The non-Mendelian nature of Darwin’s view explains why the early geneticists rejected it. But what about the alleged restoration of Darwinism in the Modern Synthesis? Did Fisher, et al. simply steal the ideas of Bateson, et al. and re-brand them as Darwinian? Is the Modern Synthesis just another name for Mendelian-mutationism? With regard to much of the scientific content (ignoring the social elements detailed by Betty Smocovitis), yes. Fisher, et al. took the conceptual foundation built by early geneticists, claimed it on behalf of Darwin— or rather, a re-invented version of Darwin as a closeted Mendelian-, and simultaneously denigrated the geneticists’ roles in these developments. There were real scientific differences, however. A form of Darwinism was eventually restored via the Modern Synthesis, based on a very specific claim (the gene pool) about how population genetics works, a claim that the early Mendelians did not accept. Now that I (hopefully) convinced you that the Mendelians were not clueless or a dead-end in the history of evolutionary thought, my next post will counter the common claim that the Mendelians assumed mutations were large, as well as explain why they criticized Darwin to such a strong degree in the first place. Thanks for writing about this Kele. I would put it differently in regard to the statement that contemporary evolutionary thinking “could be just as rightfully called neo-Mendelism and credited to Bateson, Punnett, Morgan, and Johannsen,” because I think we are still using the language and customs of the Modern Synthesis even though its major claim has been abandoned. For instance, I don’t think the “random mutation” and “raw materials” doctrines would still be taught in textbooks if the Modern Synthesis hadn’t happened. This isn’t just for popular science. In my recent paper with David McCandlish (http://www.jstor.org/discover/10.1086/677571?uid=3739704&uid=2134&uid=2&uid=70&uid=4&uid=3739256&sid=21104586055623), we draw attention to the fact that there is an entire branch of evolutionary genetics, widely applied in evolutionary analysis, that assumes evolution is a simple mutation-fixation process where selection acts as a sieve– something the MS clearly rejected. These models first appeared in 1969, and now are widely used. Sometime they are neutral models but they also include models such as the “mutational landscape” model of adaptation developed by Gillespie and further developed by Orr.